Jake painted this piece for the ceiling in his art room. It will be on display for years to come, no doubt influencing future students. Nice work! 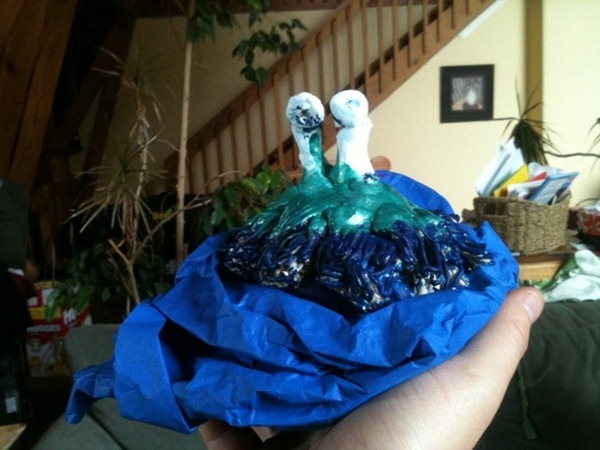 It’s high-fire ceramic, and I made it a couple of years ago. It adorns a sacred niche by the front door, and serves as protection from evil, evangelists, and other threats. 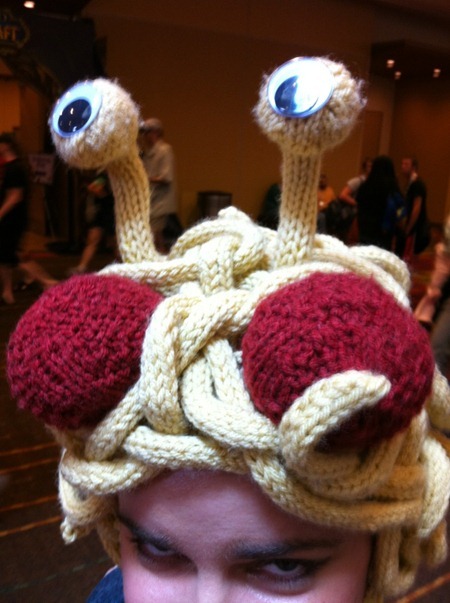 I am a recent convert to Pastafarianism. I saw the news about the guy in Austria getting his official ID picture with a pasta strainer hat, and had to know more about the Flying Spaghetti Monster. 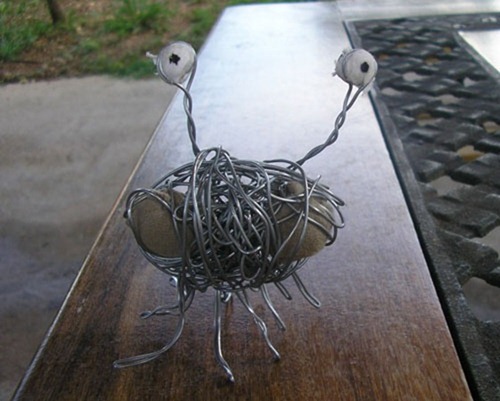 I dimly remember mention of FSM in the past, probably in 2005, but didn’t then realize the good work that was being done in keeping ID out of the schools using humor and reason, but am now completely converted. I wanted to share a picture of the applique I just completed, especially since I won’t be able to wear it for quite some time. (It’s on a fleece vest and the heat index was over 100 most of the time I was working on it.) 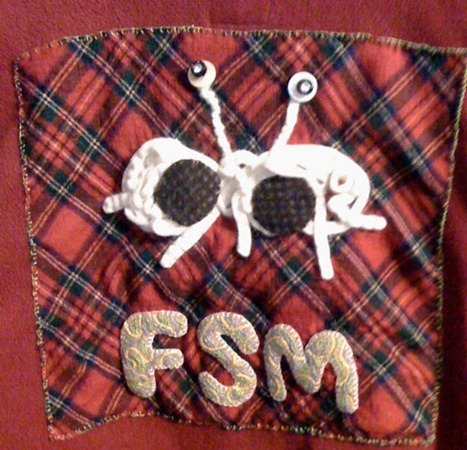 I wish your store had jackets or coats so we could show our FSM pride all year long here in the north, t-shirts just aren’t visible for much of the year in the upper Midwest. I love this video so much. Years ago I had the experience of watching an authentic over-the-top propaganda show and this video is spot on. Who can resist accepting information as Truth when it’s set against delightful music and animation? I think all good propaganda straddles the boundary between happy and creepy. My question to you is: what emotions did this invoke? I am a huge fan of The Church of the Flying Spaghetti Monster and I also make natural lye soap, so of course I had to find a way to marry the two. I have created these soaps – they smell like spaghetti sauce – oregano in tomato sauce. Since these are lye soaps, they don’t dry out so they also make excellent decorations. I have one watching over me at my desk at work. Samuel received this for his birthday. Very nice. I can’t quite tell what the meatballs are made of. Here is our friend Stephen Klinger’s newest creation. 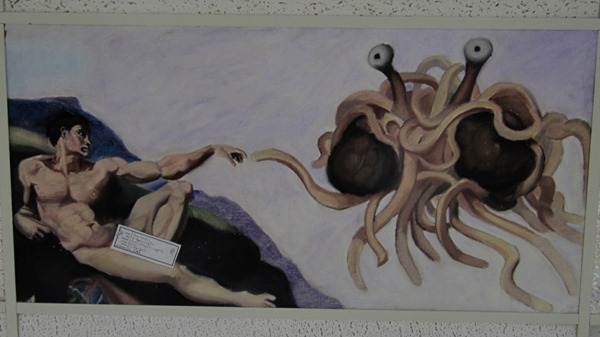 What I like most about this piece, besides the FSM pouring beer on a stripper, is the prominent display of Jesus – an unexpected element in Pastafarian art. I can imagine both Christians and Atheists might be offended over this, if they try. I think that’s what I like about it. 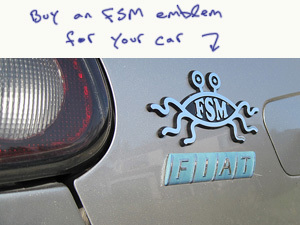 I am a devoted and practicing member of the Church of the FSM. I am also a stripper. Sure, laugh it up. I take my job seriously, and I love my job. It just so happens that I’m quite capable of reasoning and critical thinking, though, and when introduced to the Church and its teachings, I immediately declared myself a member. It seemed like the perfect fit for me, the one I’ve been looking for all of these years. 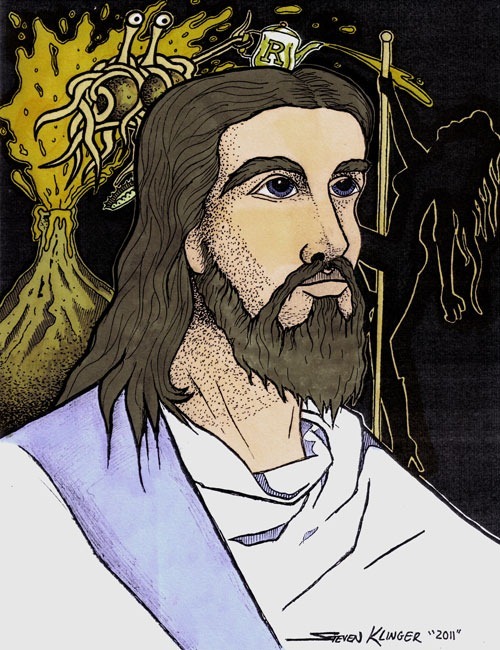 There’s a post of Jesus with FSM in the background, pouring beer on a stripper. Does the FSM really do this? I’m having a crisis of faith over here. If the FSM really does pour beer on strippers, I don’t think I can be a part of the Church anymore. It doesn’t seem like it fits the general theme of peace that is going on. I don’t think pirates would have doused strippers in beer without their explicit request to do so. And although strippers tend to love beer (And I certainly do! I celebrate on Fridays, as recommended. ), I wonder whether the stripper in the picture is actually consenting and requesting that she be doused in beer. In order for strippers to do their jobs properly, they can’t be sticky from beer, and most guys tend to want their strippers dry and clean. It also seems like it is a hazard to a stripper’s safety, and could cause serious injury or death by slipping on the pools of beer that would form. I am sure that the FSM would not want a death attributed to him, even a stripper’s. And I am absolutely positive that strippers find beer being poured on them to be too messy and too much trouble to be worth it. All of this said, I’m having a crisis of faith. 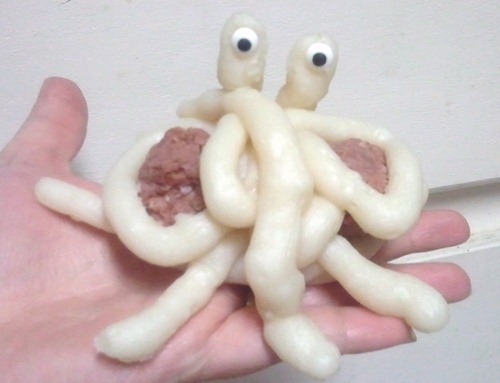 Is this what the FSM wants from me? To be dangerously doused in beer while in my 7" stilettos? I can’t risk my safety or my financial well-being. Now what? 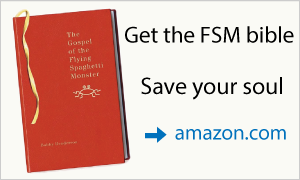 Do I leave the Church of the FSM? How do I reconcile the feelings I have about the FSM? Can anyone offer me some advice? 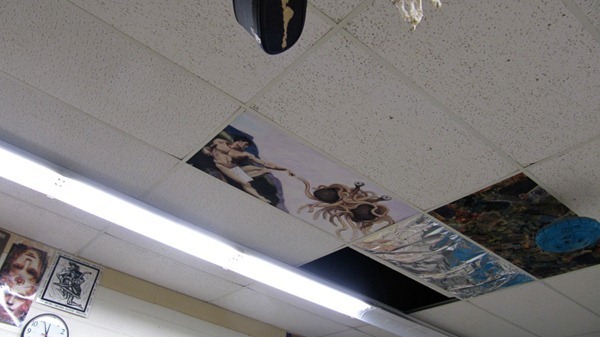 Seniors in my high school are allowed to paint a mural on the walls of the art room at the end of the year, and I chose the flying spaghetti monster. 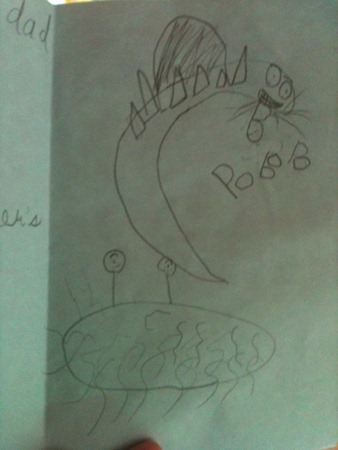 I also mentioned the flying spaghetti monster in my valedictorian speech. I’ll include it in the email. 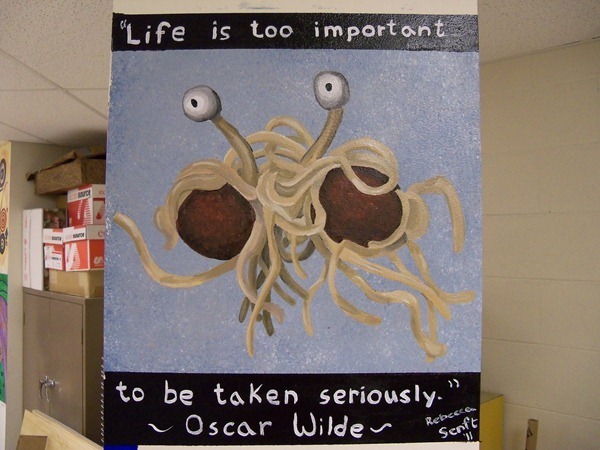 I hope the mural lives up to the image of his noodly appendages. Hi, everyone. Before we get our diplomas, I want to tell you all a short story. The story of an art project I did. At the end of the year, each senior in art is allowed the opportunity to preserve themselves in a mural on the walls of the art room. I decided I wanted to paint one. The only question was what would I paint? I considered pop culture references and inspirational flowery messages of hope, but ultimately, I decided on something I thought was strange enough to inspire interest and maybe a few people could look at it and see something uniquely for themselves. 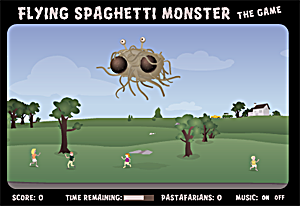 I chose the flying spaghetti monster. 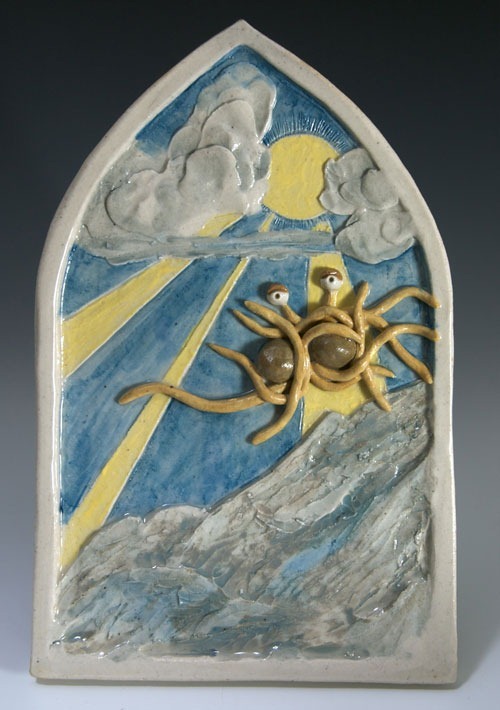 For those of you who don’t know, the flying spaghetti monster is the emblem of the “pastafarian” movement, which is a rather silly group that questions the validity of blind acceptance, instead promoting logic. I did not choose the flying spaghetti monster to make a political or religious statement. 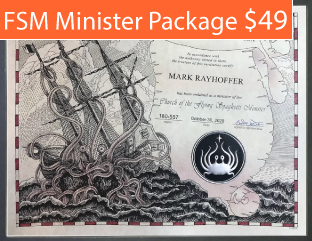 To me, the flying spaghetti monster represents an ideal I think is being undervalued in our society—the ability to laugh at things that are ridiculous, and more importantly, the value of being ridiculous and silly. A thing does not have to be serious in life to be important. I think that that’s something I never really understood before. The importance of being unapologetically ridiculous, the joy that humor can bring, the profundity of absurdity; it’s all so clear to me now. The outlandish can instill wonder and happiness. What better reason is there for art? And so I painted the flying spaghetti monster, hoping that someday, someone would find in it a muse of silliness for their own life, something to tell them to be novel and unafraid to take chances. If I could offer you all one bit of guidance from my life to your own, whether you are going to work, college, or the military, it would be that when life gives you the chance to go on an adventure, always take it. 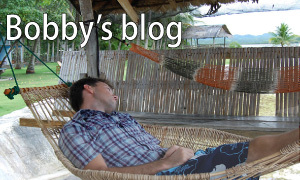 It doesn’t have to be the literal road trip, or journey-through-the-jungle-kind of adventure. It just has to be something new. And it doesn’t always have to be a place. An adventure can be a job, or a class, or a person. Always remember to push yourselves out of your comfort zones. Most of my regrets from high school have been not going on an adventure because I was too afraid of failing. And I don’t think I’ve ever regretted an adventure either, even if it rains, which usually does happen. It’s taken me a long time to understand this, but living in the moment doesn’t have to be a bad thing. The realization that absolutely everyone dies and that this single day will mean very little in the larger scope of my life has allowed me to let go a bit. Relinquishing those fears that we bear as shields over our hearts is never easy, but well worth it, however uncomfortable it may be. So, as we walk into a different stage in our lives, I encourage you all to improvise, to sample everything, to search until you find a dream, and fight until that dream is realized. Remember to search for wonder, and every now and again, let curiosity get the best of you, for it’s the only way to continue to grow, and always keep your heart and mind light. In the words of a great playwright and my favorite author, “Life is too important to be taken seriously.” Stay gold, everyone."